The stunning Divya Khosla Kumar closed the Delhi Times Fashion Week last night for ace designer Ritu Beri as the finale showstopper. 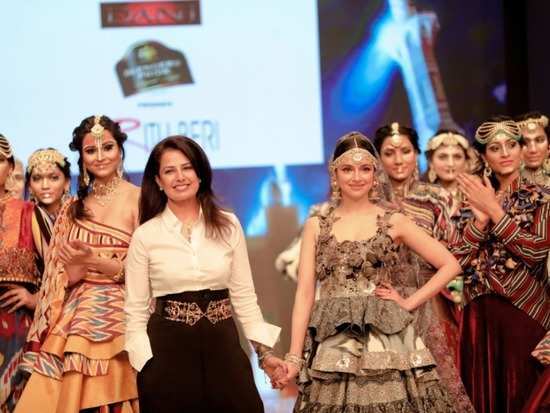 Ritu Beri showcased an amalgamation of Indian and Uzbekistan culture through her collection. Actor-director-producer, Divya Khosla Kumar walked as the showstopper for the show. The stunning diva took the ramp in an intricately embroidered olive-toned lehenga skirt and a peplum choli of the same colour tone. With an olive-toned lace dupatta as the veil and ornate mattha patti and jhumkas, Divya looked radiant as a neo-aged culturally-ambiguous queen. Known for her visually-driven cultural amalgamation in her designs, Ritu Beri’s latest offering “Ferghana Fantasy’’ was no different. The collection was a fresh take on traditional Indian wear with a dash of design elements from Uzbekistani culture. With a spectacular display of Ikat, antique silver jewelry and brazen use of tribal paint – the collection reminded us of a free-spirited gypsy princess but at the same time, it was nothing like anything we had ever seen before. The amalgamation was an attempt to promote the idea of mixing Uzbekistani ikat with Indian fabrics. Ritu even ensured that all the ikats used for the collection were flown over in Indian from the Central Asian country. Ruffled hemlines, vibrant colour, a juxtaposition of varied ikat weave and embroidery contributed to the collection’s highly striking visual appeal. We're honestly still reeling from the visual treat we just witnessed! 4Day 1 of Delhi Times Fashion Week was all kinds of glamour and fun! 6Sonam Kapoor slayed in white, *again*! 7Shilpa Shetty’s latest look is proof that Orange is *definitely* the new black! 8Sonam Kapoor’s opulent white ensemble has a personal detail you may have missed! 10Day 3 of Bombay Times Fashion Week was a glamorous one!